This is a more advanced, newer model from Samsung that, compared to its predecessor, has more enhanced picture improvement technology and greater Smart TV platform. Actually, this TV is pretty close to being perfect with the only drawbacks in motion handling that could be slightly better, and the colors that tend to change at wider angles. Aside from this, Samsung UN55J6300 will provide you with everything you need from TV. It is packed with loads of new technologies developed by Samsung. Anyone looking for a great Smart TV with lots of amazing features should consider this model. Here’s what’s so great about it. This TV delivers great picture quality. One of its strong points is its contrast as well as black level performance. For instance, contrasting images with dark shadow elements and bright highlights are rendered very well, and they contain deeply saturated blacks. 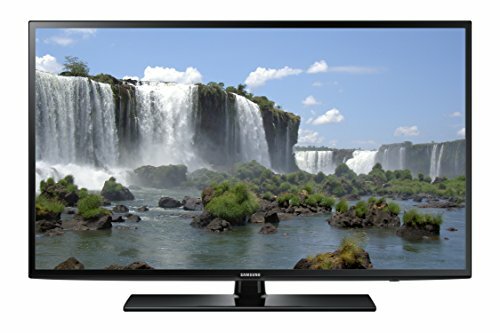 The Micro Dimming Pro is one of the amazing picture enhancement features found in this TV. This technology is used to improve the dark zones of a picture resulting in a more vibrant picture that has amazing contrast. Also, it minimizes distortion or the so called “halo effect” so that the full HD pictures can be shown much clearer with more details. The Wide Enhancer Color Plus is another innovative technology within this TV in order to improve its color richness. Furthermore, Motion Rate of 120 on Samsung UN55J6300 decreases motion blur in fast moving scenes. Unfortunately, this model from Samsung isn’t equipped with a smart panel system, so the side viewing angle could be a small issue here. The Smart TV platform on this model from 2017 is installed for enhanced user experience with loads of sophisticated functions. It runs on quad core processor, which is pretty powerful. You can use either wireless or cable connection to browse the web really easily without hassles. Also, Samsung has provided loads of music apps and video streaming selection, ready to use. Of course, if you own other Samsung devices like Samsung smartphone or tablet, you can simply and easily share content to or from the TV. Aestethically speaking, the design of this Samsung’s model is pretty simple in appearance, but still very nice looking. The black bezel surrounding the screen is really thin and measures under a ½ inches at its slimmest point. Panel depth measures less than 2 inches at its thickest point. A V-shaped design and an elegant brushed silver finish of the TV’s stand has a high-end look. The TV screen features a matt finish and is also illuminated with edge-lit LED backlighting.